When it's just cool enough to call for core warmth, this men's vest has you covered with a lightweight and insulated design. The durable CORDURA® fabric shell is lined with smooth nylon, and it has a design that layers well underneath heavier coats in the winter. Designed to make water bead up and roll off, it keeps you dry in a light rain. Machine wash cold. Do not bleach. Tumble dry low. Iron low heat. Do not dry clean. Nice light weight vest that looks and feels good, but also privde warmth. I love the vest (the style & fit is ideal). However, without color names on the website, I was under the belief that I was ordering the same color I had before (Olive). I’ve only worn the new vest once. Is it possible to trade in for one that’s Olive in color? Please advise. Excellent vest. Warm, rain resistant, and rugged. Perfect fit. Great style and fit is perfect. Runs a size too large. I have tried Duluth Vest, Ariat Vest, and this is now my favorite. It is light weight but keeps the core warm in the Cold Colorado mornings. This is my husband's 3rd vest. He likes this vest so much he keeps one for working in his shop, one for driving his Road Tractor and one for good. I also have one that I wear when I go grocery shopping or to work. They are lightweight, plenty of pocket room and a chest pocket for a cell phone. These have been some of the best clothing purchases I have made. I definitely would recommend this vest. I looked long and hard for a good vest I could wear to the construction site in the spring in fall without looking too out of place if I walked into a business lunch with it still on. I looked at a variety of different brands and eventually settled on this one. Couldn't be happier. The vest is thin and lightweight without sacrificing warmth or durability. I can tell the snaps on the front pockets and zippers throughout the rest of the vest are high quality. I also get the feeling that it was designed by someone who's first priority was to make a piece of clothing that is functional and that shows when you wear it. The waterproof fabric is nice both because it doesn't soak up water but also because it seems to be a bit more durable that the fabric that other companies would use. I definitely recommend. The Gilliam vest gives a very nice appearance and looks to be very well made. I was disappointed in that it is thin and would not provide the warmth that I was looking for. I found a similar vest made by a popular outdoor sports wear company that was insulated with down on sale for only $15 more and with free shipping. I ordered their large size which turned out to be 1 inch longer than the Gilliam that I ordered in a large tall. Needless to say, I'm returning the Gilliam. Size, fit, and comfort are spot on. Love it. I own 3. Light weight, comfortable, and warm. Exactly what I was looking for, however, I would replace the snaps on the pockets with zippers to better secure valuables. I love this vest. It fits and looks great. It is comfortable and warm. I receive numerous complements every time I wear it. My son is a first repsonder and he lives in his vest. Nice vest. Great for tall guys. Nice vest. Glad I bought the tall as I am 6’2”. Only thing I would change is to add a zipper to the main pockets and have a little more insulation. Sizing was accurate. We're sorry to hear this vest did not meet your expectations. Please contact us at 1 800 833 3118 if you need any assistance. Light weight, fits great under or over other garments. Gives that little extra bit of warmth with out being to bulky. Would recommend. I wear one almost everyday, have all the colors. The weight, fit, and style are outstanding. Perfect vest for the fall and spring or to layer in the winter. lt is lightweight and warm. Neck collars are little long. Temperatures are currently in the single digits here in Alaska. Vest is perfect. Warm and protective against the winds. I returned it. Paid nearly half the price of the vest just to ship it back and have not been credited for it yet. It’s been over two weeks. Free shipping on returns would have been great. I canceled a huge order because of it. Great vest! It’s lightweight and looks good. Fits awesome, feel wonderful, keep up the good work! I wish it didn’t have such a big collar on it but besides that, I love it! I love these things! This one is my 2nd purchase in X-Large for wearing over bulky winter shirts, sweats, or sweaters my first was a Large for wearing under lighter weight coats. If you're looking for something light and not bulky but truly warm for layering this one is it! Looks good, it's comfy without the weight and bulk of a traditional Carhartt heavy weight work vest. One of my favorite pieces of winter clothing now! Perfect fit! Lightweight and warm. I certainly would recommend this vest to anybody that asked about it. A Comfortable fitting vest with classic lines, an excellent value for the $$. Very lightweight vest, but the material seems tough. I find it to be all I need in 35-40 degree weather when paired with a flannel shirt. I’m 5’10” 170 lbs and the medium is perfect. Perfect gift for the guys! I have one of these for myself and love it. I decided to buy my dad, brother-in-law, nephew and nephew-in-law each one for Christmas. Perfect gift! They are warm and comfortable. I'm actually buying myself a couple of more. Great fit and functional keeps your core worm. My boyfriend is a big guy so finding flattering functional stylish clothing can be a challenge. The vest is well made and looks great, he wears it everywhere and he is so happy and so am I. A very style conscious NYer. I love this vest! It’s surprisingly warm and i wear it everyday over my hoodies. I wash it only with a tech wash to keep it nice and waterproofed! Nice vest. Lightweight. Used if for layering under a heavier jacket and it worked well. I need to return this vest as it is just a little small. Great feel and fit. Ordered on a Monday, at my door Wednesday noon. Great service. Ima 2xl do I need one size smaller or can I stick to my normal size? No! I think it runs the size as is. I always wear a Medium and it fits good. I’m not one to wear anything baggy, especially being a union carpenter. That can be dangerous! I like my clothes just the right size, but that’s me. I got a 2X Tall and it fit just right for me. I like mine to be loose for layering so if you want a tight fit you might go down a size. Sizing is pretty true. My husband has 2 of these vests and loves them! Can you put the collar down? Yes, you can wear it either way. Great vest I wear mine every day, usually with a flannel, keeps me warm into the mid 30s. The collar is as soft and mobile as the vest. I usually fold it down like a polo shirt collar. Yes, stays down very well ,and good look to the vest aswell with collar down. Yes, it folds down easily. Yes you can fold it! Is this vest too bulky to wear under a coat such as Carhartt's Traditional Arctic Quilt Lined Coat? 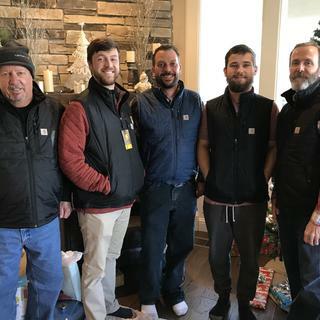 Good evening David, I purchased the vest to wear under my own Carhartt jacket for cold days and it fits great, not loose or bulky. Purchase the size you normally wear and you won’t be disappointed. It should fit easy under a coat . It did for me but not the exact coat. Probably depends on how each piece fits you. No it is not to bulky to wear as a mid-layer. it is not puffy like the Michelin man. No it is not. It’s perfect. Wish there was one in orange to bird hunt in. Is this vest too bulky to wear under a coat, such as Carhartt's Sandstone Traditional Coat/Arctic Quilt Lined? BEST ANSWER: The vest I bought for my husband It is not bulky but I still think it’s not ideal to wear under a coat. It’s light /thin typically he’ll wear it with a thick flannel and what not. Hope this sort of helps. No not at all! It's the perfect thickness, my husband wears it with his flannels but is just thin enough for those days you need a coat too. It's not bulky. It would fit under certain coats. It's probably better suited to layer on top of flannels or sweaters though. It is not. I often wear mine under a hard shell with no restriction in movement. It is definitely not bulky. You can wear it under any coat. When are you getting more orange vests in for sale? This vest is true to Carhartt sizing. Personally, I usually wear a Large jacket in most other outdoor brands. My Carhartt jackets and sweatshirts usually fit better if I order a medium. Yes they are true to size! My boyfriend is a medium, I bought him an orange one for hunting & he can wear all of his layers & put the vest on & even close it with the layers! Yes true to size. I wear mostly small. This vest fits great and also keeps my body warm as a liner if I want to wear it under a jacket. Best fit in general is tough , yes mine was true to size but why not order 2 vest, try them on and return one! Yes. I’m satisfied with the way it fits. what is the back length of the 2XL (Regular) Gilliam vest? what is the back length of the Large Gilliam vest? BEST ANSWER: It is about 28." Is the vest reflective (orange color) - would it be good to wear in order to be seen while walking at dusk or dawn? BEST ANSWER: This is not a reflective vest. No it isn't reflective. Its just bright orange, almost a blazing orange like the hinting vests. I'm 6ft, i ordered a XL, I'm going to exchange it for a XLTall. if your looking for safety, they do offer reflective shirts / coats. In both orange and neon green. Hope this helps. What is the length on the small front and back and chest measurement? Trying to figure out if this will fit my small framed son at 5'4"
BEST ANSWER: The small has a center back length of 27 inches and the chest measures about 40 inches from the armhole. The front length is 26.25 inches from the highest point of the shoulder. How does this vest compare to the 101448? BEST ANSWER: This is the updated version. They are made of the same material and appear the same. The only difference is that style # 102286 is going to be a little bit longer. How would the length compare for this vest between a Large tall compared to a Regular XL? BEST ANSWER: Large tall measures 30 inches from the center back collar to the bottom of the vest and XL regular measures 29 inches. How many ounces does this vest weigh? BEST ANSWER: The vest ranges between .7 lbs to .925 lbs, depending on the size. how do I return this vest? How many pockets on the inside Pockets large enough for a 38 pistol? BEST ANSWER: There are two pockets on the inside. The zippered one on the left inside chest would fit a snub nose or a .380, but it would conceal very poorly. I put tools in the pockets during tasks while working, but the weight pulls down the best conspicuously. I put my Smith and Wesson, Model 10, .38 with a 2 inch barrel in the left inside pocket. It's a squeeze but it fit and zipped up. It would be hard to get out in a hurry. does this vest snag easily? BEST ANSWER: No. It is extremely lightweight and very comfortable. I wish they made it in more colors, I'd buy several of them. The outer shell is really tough. I wear it in a heavily wooded area and it never snags. How does this compare to the camo quick duck for warmth? I am not familiar with that article you mentioned, however the vest I purchased would probably not be viewed as a garment indicated for significant warm. Hope this helps you. BEST ANSWER: There is a slight noise as this is a heavy duty nylon. I haven't noticed a loudness in the vest, but haven't thought about it in context of hunting. There will be a "swooshing" sound when brushed against branches but from a normal motion of walking or raising and lowering arms don't notice anything unusually loud.